It takes a brave, confident person to lay themselves bare before others, to openly analyze their choices in life and share what makes them happy, sad and concerned. In the essay collection Hero in My Own Eyes: Tripping a Life Fantastic, local writer Max Roytenberg – with whom Jewish Independent readers should be familiar – is at turns funny, wistful, belligerent, humble, egotistical and sentimental. He’s everything we all are. In reading his stories, we learn about ourselves, as well. 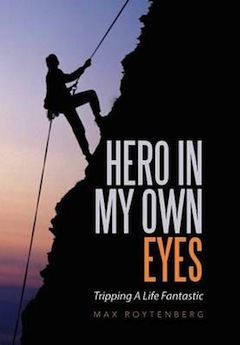 The collection is divided into three parts – “Looking Back,” “Living the Life” and “Looking Forward.” In the first section, Roytenberg recounts stories from his childhood in Winnipeg, outlines the various jobs he had during his career and the cities in which he lived, and touches upon his first two marriages and some of their challenges. It ends with “The Kiss,” about how he – a widower in his early 70s by that time – finally managed to connect with the woman he had loved since his youth; she had long been an widow, too, and was about the same age. The second section is focused on their life together, and it is obvious from his writing that he is smitten and he is happy. 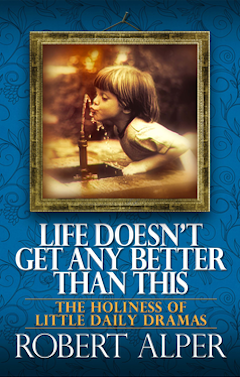 While still upbeat and energetic in the third section, the pressure of time is ever-present, as he is now an octogenarian, and he is contemplating who he has become, what impact he has made in the world and how he should spend the rest of his life. Roytenberg seems to be quite a character. He often refers to himself in the third person, as Maxie, and calls his wife Cookie, my Bride, rather than by her name. There are times when you want to pat him on the back – such as when he manages to push through a regulation change that was being held up by an official who may have been corrupt – and times when you want to shake him, such as when he is basically dismissive of a 28-year-long marriage. But then you want to hug him, because he stayed with and supported his second wife, Ruth, during her eight-year fight with cancer, and you want to jump for joy when he does make the move on his lifelong love, Cookie, and she says yes. By the third section, when he’s so honestly discussing whether he lived up to his own expectations, about winding down (though he also talks about the benefits of not having the time to dilly dally anymore), his children and grandchildren, his gratitude and what he might do tomorrow, it’s quite moving. He touches universal chords in many of his musings and, by the end of the book, you may or may not consider him a hero, but you’ll thank him for sharing a bit of himself with you. And maybe that bit will help you to see the hero in you. When it comes to Rosh Hashanah, I’m a big fan. It’s hard not to love a Jewish holiday that’s all about spiritual renewal, deep reflection and heartfelt promises to work harder to present our “better selves” to those around us. But, as I move into my mid-40s, I’m realizing there’s more than that to the Jewish New Year – more than those deep brown challahs filled with sweet raisins, more than the novelty of dipping apples in golden honey and dripping them all over the tablecloth before a great meal. Rosh Hashanah is also a profound vessel of memory and, as I defrost my brisket, hunt for the best-yet new quinoa recipe and knead and shape my challahs, I’ll be thinking of the past. I don’t realize, until Rosh Hashanah rolls around, how vividly that past is available. I yank those memories from the recesses of my mind and daydream my way back to a 14-year-old self growing up in Cape Town, South Africa. Back then, Rosh Hashanah meant receiving a batch of my grandmother’s taiglach, a recipe I’m still determined to tackle and one that will take me, in spirit, immediately and joyfully, into her tiny kitchen. It meant hours in synagogue, listening to the deep baritone voices of the Rondebosch shul choir, and the wonderful melodies of the cantor, who we imported from Israel for that time of year. It meant family discussions on who to invite to our Rosh Hashanah table, and long debates about whether we could tolerate, for another year, the uncle who arrived in his farm-stained overalls and fell asleep on the sofa before the meal was over. Or the aunt who was always asking for recipes (and never using them) and used fingers, rather than salad servers, to select the leafy greens she wanted on her plate. There were wild cousins whose antics my parents weren’t certain they wanted unleashed in the house. And friends whose children my sister and I wanted nothing to do with and campaigned loudly for their removal from the guest list. With hours before the festival’s arrival, as my mother’s culinary activities sent rich aromas wafting over the house, we kids were in charge of setting the table and removing from the dusty cabinet the exquisite glasses my parents had bought while on a Venice honeymoon 15 years earlier. We’d craft name tags and carefully position them around the table, ensuring we occupied the best seats in the house. And we’d decant the wine an elderly relative had made, pouring it carefully into the crystal decanter only used on such occasions. At the time, I rolled my eyes at the list of chores, grateful for the reprieve from school but unappreciative, as only a teenager with little worldly experience can be, of the treasures at that table. The family members we’d lose as age and cancer robbed them of more time with us. The recipes I’d never have the foresight to record and the hugs and kisses I never cherished long enough. What I did bring with me over the decades, that would follow me into married life with children, was an unbridled love for Rosh Hashanah and a determination to make it as memory-laden, meaningful and delicious as possible in my home. It’s why, this year and in the years ahead, I’ll spend hours on dishes I’d never normally prepare: sodium-filled chicken soup with kneidlach, tender brisket that will tempt even the avowed vegetarians among my kids and wafer-thin kichel biscuits, perfect with chopped herring. Maybe I’ll even summon the courage to attempt baking sweet, sticky taiglach, a recipe that requires copious amounts of syrup and hours of careful babysitting. I’ll do all this and more in the name of memory, because it will conjure my own past, a continent and lifetime away, so vividly. And I’ll hug my kids extra-tight, subdued in the knowledge that, one day, they, too, will celebrate this holiday with their own families after I’m six feet under, hopefully cherishing the food and love-laden Rosh Hashanah memories of their own long-gone childhoods. 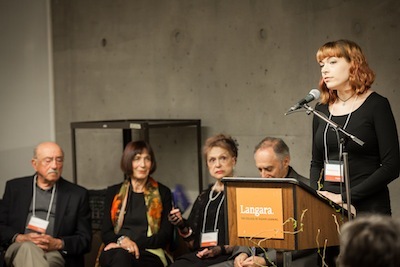 Emotions were high at a graduation event where survivors of the Holocaust and Langara College students who wrote their memoirs shared their reflections on the experience. Writing Lives was a two-semester course and a partnership between Langara College, the Vancouver Holocaust Education Centre (VHEC) and the Azrieli Foundation. In the first semester, students learned about the history of European Jewish culture and the Holocaust. In the second term, groups of three students were teamed with a Holocaust survivor. Students interviewed the survivor, transcribed their recollections and wrote their memoirs, which were presented at the closing event April 20. Dr. Peter Suedfeld, professor emeritus of psychology at the University of British Columbia, spoke on behalf of the survivors who participated. He was pleasantly surprised, he said. Frieda Krickan, speaking on behalf of the students in the program, saw Writing Lives as an opportunity to honour the survivors, deepen her knowledge of Holocaust history and serve her Jewish community. Gene Homel, an instructor in liberal studies at the B.C. Institute of Technology who taught part of the Writing Lives course, said evidence-based and factual history are important at a time when the veracity of events past and present are being called into question. The collection and preservation of eyewitness accounts is what makes the Writing Lives project so valuable, said Ilona Shulman Spaar, education director at the VHEC. Robbie Waisman, one of the survivor participants, said the greatest fear that Holocaust survivors have is what’s going to happen after they are gone. Serge Vanry, another survivor participant, said it was an experience that he hadn’t expected. Other survivors who participated in Writing Lives were Alex Buckman, Amalia Boe-Fishman, Jannushka Jakobouvitch and Mark Elster. Excerpts from student-participants’ journals have run in previous issues of the Independent (search “Writing Lives” at jewishindependent.ca). Mines added that she hoped this pilot project of Writing Lives would become an ongoing program and, in the days following the closing ceremony, she received the news that Writing Lives will indeed run again, starting in the fall semester. Pat Johnson is a communications and development consultant to the Vancouver Holocaust Education Centre. This is the third of a three-part series on Writing Lives, a two-semester project at Langara College, coordinated by instructor Dr. Rachel Mines, in which second-year students are teamed up with local Holocaust survivors to interview them and write memoirs of their experiences before, during and after the Holocaust. The course is a partnership between Langara, the Vancouver Holocaust Education Centre and the Azrieli Foundation. As part of their course work, students are keeping journals of their personal reflections on their experiences as Writing Lives participants. This week’s journal is entitled “The Importance of Memoir.” Here are some excerpts. Our survivor has repeatedly stated that he and his peers greatly fear that, once they are gone, no one will remember what they went through. Survivors worry that, once they are no longer here as living testaments, their suffering and the people they lost will be forgotten. Our class, and other projects like it, is working to ensure that does not happen. We must preserve the experiences of Holocaust survivors in written form so that, once they are no longer physically here, their story will be. 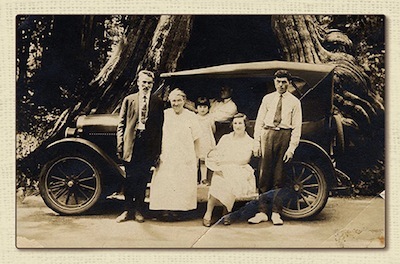 We are not only archiving personal anecdotes, we are putting a human face on history. Facts are important for historical validity, but personal perspectives are essential in creating empathy. This program is chronicling history in such a way as to touch people and make them care about what happened to the Jewish people (and others) during the Holocaust. Empathy is one of the greatest tools in breaking down intolerance. Once we see the humanity in others, it becomes harder to hold onto prejudice and hatred. Now, more than ever, it is vital to create this historic empathy. Prejudice and persecution are becoming ever more prevalent in our society, and it is up to us as a nation to halt such hatred. It is essential to remind the world what can happen when hatred is met with social apathy. 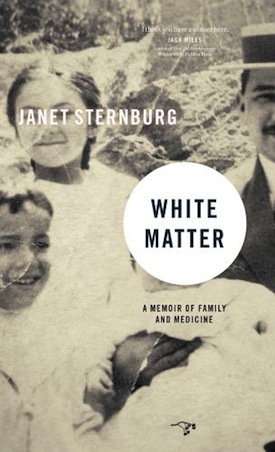 These memoirs are a documentation of the horrors that unchecked hatred can lead to. I believe in the power of memoirs, the power of living history. I am honoured to be a part of such an important project at such a crucial time. The first time I interviewed a Holocaust survivor, I was nervous, and rightfully so. My interview partner and I had been preparing for months before our first meeting but, nonetheless, when our interviewee arrived, I was so star-struck that I briefly lost my aptitude with the English language altogether. All I could manage to say was multiple renditions of the same sentence, thanking him again and again for his time and for agreeing to meet us. Our interviewee, R., was gracious and didn’t miss a beat. He chimed in every time by thanking us in return just for listening and told us on multiple occasions, “I am so grateful for what you are doing. This is very important to make sure that the Holocaust never happens again.” His response surprised me but, the more I listened, the more I realized that this project meant more to him than just sharing his story; it was his personal call to tikkun olam, to repair the world the best that he can. I learned that every Holocaust survivor’s greatest fear is not what you would expect. It is not death camps or gas chambers – instead, R. told us that their greatest fear is that no one will remember their stories when they are no longer alive to tell them. They are afraid that, with today’s ugly resurgence of antisemitism, everything they endured will be meaningless in the face of a society that cannot wait to forget. In a world that wants us to keep silent, it is every survivor’s hope that we raise our voices – that we proclaim the truth until our breath runs out. Our sacred duty is to empower the ones who can no longer empower themselves, and the key to making sure history never repeats itself is to tell their stories. During this course, my group members and I spent a concentrated amount of time with a child survivor of the Holocaust. Time and time again, he narrowly escaped falling into the hands of the Nazi regime…. His story is inspiring, heroic, terrifying at times, and very emotional. He tells his story with such grace, in such detail, that we could clearly visualize in our minds what he had experienced. During and after each interview my group conducted with R., he thanked us multiple times. He thanked us for taking the time to listen to his story, for writing his memoir, and even for sharing parts of our lives with him. Every time he thanked us I was taken aback: why was he thanking us for listening to him, when we were the lucky ones? We were being given the opportunity not only to listen to a Holocaust survivor speak but to write a memoir that would continue his legacy throughout time. At first, I struggled with his gratitude; I was almost uncomfortable with how genuinely thankful he was that we were spending time with him and listening to his story. Yet no matter what I said, he was grateful. It took me quite awhile to grasp exactly why R. felt the need to continually express his gratitude. In fact, R. did not grow up in a world that accepted the events of the Holocaust as facts and wanted to learn more about it. He grew up in a world where no one wished to speak about the Holocaust and its events were contested. He did not conceal his experiences only because they were too painful to revisit, but also because no one wanted to listen. Not only did those affected by the Holocaust lose their families, their homes, their childhoods and years of their lives, but in many cases they lost their voices. For years, the world refused to listen and, because of that, we lost many valuable stories. Memoirs are important not only because they give survivors the opportunity to share their stories, but because, on a very small level, they begin to give a voice back to the voiceless. Although we can’t bring those survivors back and prove to them there are people who care and will listen, we can make sure the survivors who are still alive do not go unheard. This fall, a select number of Langara College students embarked on a project to write the memoirs of local Holocaust survivors, capturing personal stories from the Second World War. The project is called Writing Lives: the Holocaust Survivor Memoir Project. Writing Lives is an eight-month collaboration between Langara’s English and history departments, the Vancouver Holocaust Education Centre (VHEC) and the Azrieli Foundation. In the first half, students learn about the history and impact of the Holocaust. In the second half, students are paired with local Holocaust survivors associated with the VHEC. “Writing Lives provides an opportunity for students to immerse themselves in the history of the Holocaust beyond physical textbooks,” said Rachel Mines, Langara English instructor, and project coordinator. For example, on Nov. 9, students commemorated Kristallnacht (The Night of Broken Glass) by lighting candles in memory of the violent anti-Jewish events that took place on Nov. 9 and 10, 1938. The course also regularly features a series of guest speakers from different organizations giving their perspective on the events surrounding the Holocaust. “I feel grateful for the opportunity to investigate the events and prejudices that served as a catalyst for the Holocaust. With the help of survivors, professors, librarians and fellow students, I am learning that individuals, communities and organizations all have agency when it comes to fighting racism, and how we can work together to prevent such tragedies in the future,” said Lucille Welburn, a peace and conflict studies student who is taking the course. 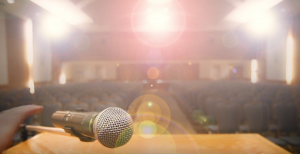 For the VHEC, survivor testimonies are seen as a useful and powerful method for teaching about the Holocaust. This spring, students will be matched with Holocaust survivors to write their memoirs. The memoirs will be archived at the Azrieli Foundation and the VHEC, with a possibility of being published for public awareness. Many people have read an enormous amount of Holocaust literature during their lifetime. The stories are tragic, horrifying, heartbreaking. No matter how many books you read, or films and documentaries you see, you can never come to terms with the fact that such evil exists in the world. 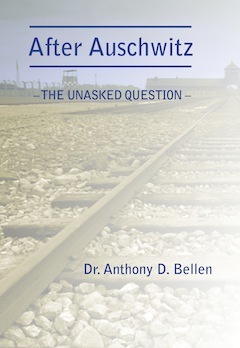 But Dr. Anthony D. Bellen’s book – After Auschwitz: The Unasked Question (Mazo Publishers, 2016) – is different. He is a clinical psychologist specializing in post-traumatic stress disorder, moral resilience and restorative processes. He lives in Israel, is a husband, father and grandfather, and has retired from the Israel Prison Service, where he headed the department of treatment and rehabilitation. He now works with people who have suffered trauma. Bellen has chosen six survivor interviews for this book from 56 he conducted with Holocaust survivors in 2004 for his doctoral research study in the department of criminology at Bar Ilan University. The six gave him permission to share their stories, although their names have been changed for privacy. I don’t think I will ever forget any of these stories. 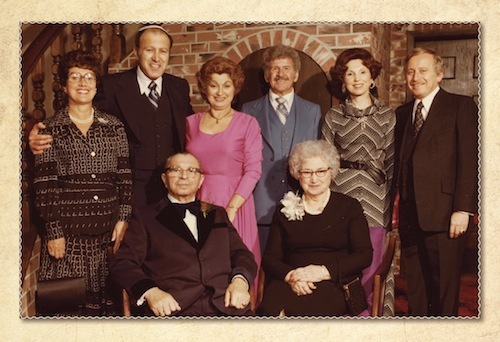 Motti’s moment of happiness occurred on the day of liberation from Theresienstadt, when a Russian soldier stood on a wooden crate and called out in Yiddish: “Has anyone seen my mother?” For Ida, it was finding a friend from her village – Miryam. For Eva, it was finding her hairbrush from home that her brother managed to give her before he was gassed in Majdanek. Reuven’s moment of happiness came in a swimming pool with two friends. Ya’acov’s joy came from meeting the love of his life, Sonya, in a laundry in Brintz. Sarah’s positive memory came from a Christmas in Bromberg, where she and some friends “performed” a song for the SS and later for the inmates of the camp. These were just miniscule moments of happiness, gone in a flash, but powerfully remembered decades later – and never shared before. The book concludes with a bibliography and references, as well as the seven questions Bellen asked each interviewee. These remarkable stories may help other people with different traumas find the strength to overcome them. They may even change your perceptions and understanding of your own life. “I am now face to face with dying, but I am not finished with living,” writes Oliver Sacks as the dedication to Gratitude (Knopf Canada, 2015), a collection of four essays that were written in the two years preceding his death last August. “I have given much of my life to the Jewish world, and I wish I had many more years to serve this noble calling,” writes Edgar Bronfman in concluding his book Why Be Jewish? A Testament (Signal, 2016), which he completed mere weeks before his death in December 2013. Sacks was a self-described atheist. For him, it was his mother’s strongly negative reaction to the news of his homosexuality that pushed him away from belief: “The matter was never mentioned again, but her harsh words made me hate religion’s capacity for bigotry and cruelty,” he writes. 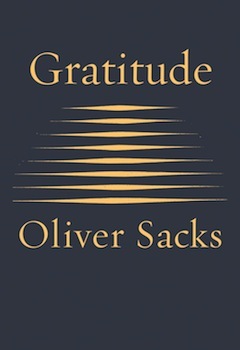 However, the final essay in Sacks’ Gratitude is called “Sabbath.” In it, he recalls his parents’ observance of Shabbat, a day that “was entirely different from the rest of the week.” He recalls how the family would mark the day, how he became bar mitzvah, his break with his family and community in England after he qualified as a doctor and moved to Los Angeles, his “near-suicidal addiction to amphetamines,” his recovery and how he “became a storyteller at a time when medical narrative was almost extinct.” In addition to being a neurologist, most readers know, Sacks was an author – he wrote more than a dozen books, including Awakenings, The Man Who Mistook His Wife for a Hat and other Clinical Tales and An Anthropologist on Mars. Gratitude is a short but powerful collection. It is masterfully written and nearly impossible to get through without crying. All of the essays have been published before, but having them together for re-reading, rethinking and re-feeling is more than worthwhile. Every read will be a cathartic experience. 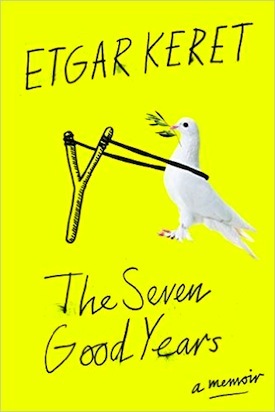 In the third of the four essays, “My Periodic Table,” Sacks talks of his love of the physical sciences and how, since “death is no longer an abstract concept, but a presence,” he is surrounding himself again, as he did when he was a boy, “with metals and minerals, little emblems of eternity.” On his writing table is a gift from friends for his 81st birthday, thallium, as well as lead, for his recently celebrated 82nd birthday. After discussing the treatment of his cancer, he expresses his skepticism about reaching 83, his bismuth birthday. He did, indeed, pass away at 82. 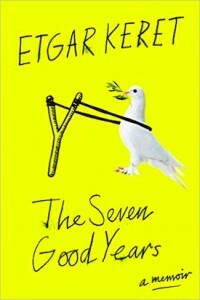 He also talks of Shabbat, referring to the group Reboot, “a network of young, creative Jews who have sought ways to grapple with questions of Jewish identity and community in terms that will be meaningful to their generation….” He gives examples of other youth who are engaged in a meaningful Jewish life and the book’s foreword is written by Angela Warnick Buchdahl, who was a Bronfman Fellow in Israel in 1989. The program for high school juniors was founded by Bronfman, former chief executive officer of Seagram Co. Ltd., who also was chair of the board of governors of Hillel International and president of World Jewish Congress. Bronfman has written other books, including The Bronfman Haggadah with his wife, artist Jan Aronson. 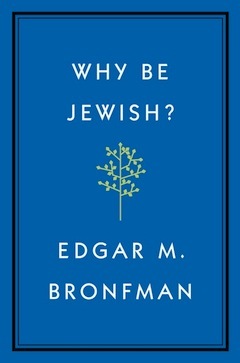 Bronfman’s approach is appealing in many ways, and he offers practical advice for the non-observant on how to connect with Judaism’s tenets and traditions. Even for the somewhat-observant Jew, many of his ideas will be interesting. His outlook is positive and well conceived. It is also inclusive. He writes, “My own feeling is that Judaism is a big family of individuals with a common bond that has stayed strong through a long history and much hardship. Those who want to become part of this story are Jews, too. I believe the tent should be open and welcoming to anyone who wishes to join.